TORONTO -- Despite summer-long speculation about where unrestricted free agent Shane Doan will continue his career, Phoenix coach Dave Tippett thinks the Coyotes, the only NHL team Doan has ever played for, still have as good a shot as any at re-signing him. Doan returned to the headlines this week when further reports surfaced of a standing four-year, $30 million contract offer he has from the Buffalo Sabres. Tippett, though, told NHL.com he has been in constant communication all summer with Doan in an attempt to convince him to stay. "I'm certainly not involved in any contract negotiations, but there are lots of conversations back and forth, making sure he knows that we're going to try to do everything we can," said Tippett, who is in Toronto attending the NHL's Standard of Rule Enforcement Meeting. "We certainly don't want him going anywhere, and I'm probably no different than the other teams trying to come to their place, I'm just trying to convince him to stay." In order to re-sign with the Coyotes, Doan wants the franchise's ownership situation to be resolved or at least close to a resolution. Although Greg Jamison is the prospective buyer of the club, there hasn't been a resolution yet due to financial and legal hurdles that he is still attempting to clear. However, the fact that Doan remains unsigned this late into the summer is a good indication to Tippett that the Coyotes' recruitment is working. 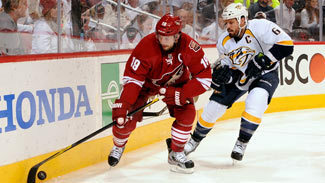 Tippett, in fact, would not discuss any fallback plans the team has if Doan were to sign with another club. "I deal with what is reality for us, and until that happens we won't go down that path," he said. "I still think there's a good chance that things will work out and Shane will stay. That's my mindset now." Tippett said the uncertainty around the Coyotes' ownership situation this summer is no different than it has been for the previous two. He is attempting to go about his job in the same manner as the other 29 coaches in the League, even though he is the only one who isn't sure if his captain will be back or if his team will even be playing its home games in its home arena. Like everyone else in the organization he wants to see a resolution to the ownership situation, but Tippett said he can't let that or the still unresolved contract situation with Doan affect his preparation for the upcoming season. "Certainly getting stable ownership would push the organization forward, but my position is to take steps forward on the ice," Tippett said. "We made strides last year, but you've gotta find ways to continue to push that ahead. It's no different than other summers, but when you do take big steps like we did last year it would be nice to use that momentum going into this season. "It's a challenge, but the players we have under contract, they're doing everything else that every other team is doing. We continue to prepare, and hopefully things work out."